You are here： Home» News» Global» Prof. Bruce A. Markell From Northwestern University Law School Successfully Held Lectures Themed As "Bankruptcy Law Series"
Prof. Bruce A. Markell From Northwestern University Law School Successfully Held Lectures Themed As "Bankruptcy Law Series"
From May 20 to May 27, Bruce A. Markell, the well-known American bankruptcy jurist and professor of Law School of Northwest University, was invited to visit PKULS to set up a series of lectures. This was also the first visiting professor since the establishment of the teacher exchange program between PKULS and the Northwestern University School of Law in 2017. On the afternoon of May 21, Prof. Bruce A. Markell held the first lecture of this visit in Room 307, Koguan Building. 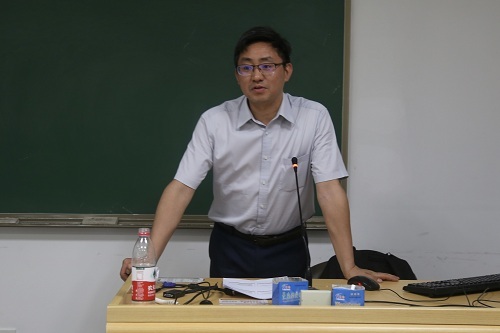 The lecture was entitled “Territorialism’s Pull in a Universalist World and was hosted by A.P Tang Yingmao. Prof. Bruce started the lecture with “Increasing Demand for Regulation of Cross-Border Bankruptcy”. He analyzed all kinds of complex corporate structures and various restructuring plans, which led to the basic theory of "Cross-Border Bankruptcy Law". In the past twenty years, the dominant idea in the field of cross-border insolvency has always been “Universalism”. According to this idea, even when it comes to cross-border debtors and their related parties, bankruptcy cases are still governed solely by the bankruptcy laws of one country. Model Law on Cross Border Insolvency, which was promulgated in 1997 by the United Nations Commission, was also adopted by UNCITRAL. Prof. Bruce pointed out that the idea of “Territorialism” weakens the universal effectiveness “model law”, and stated that the traditional “Universalism” should be replaced by “Modulated Territorialism”, as a direction for the development and improvement of cross-border bankruptcy rules and regulations. 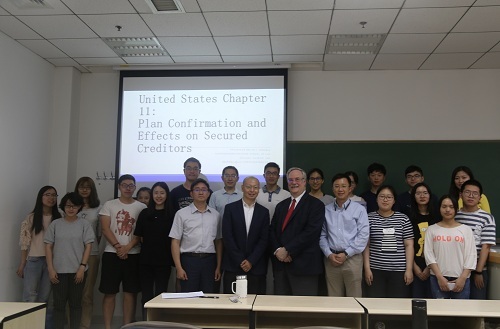 On the evening of May 23, Prof. Bruce made a lecture entitled “The Approval of Reorganization Plan and Protection of Secured Creditors under U.S. Bankruptcy Code” at Room 0101, Mingde News Building, Renmin University of China. The lecture was hosted by Prof. Xu Yangguang of RUC. Prof. Bruce started from the judicial statistics of the United States over the years, and he gave a detailed introduction to the theory and practice of Reorganization Chapter of the US Bankruptcy Law. He also introduced the legal provisions and applicable standards in procedural and substantive terms, including Disclosure, Voting, and Confirming Hearing and so on. Finally, Prof Bruce focused on explaining the special restrictions on secured creditors under the bankruptcy and reorganization system and on the social and economic value of the bankruptcy and reorganization system. The last lecture named “The Changing Nature of Debt and Equity: A Bankruptcy Perspective” was held on the morning of May 24 at room 301, the second school building. It was hosted by Prof. Xu Defeng of PKULS. At first, Prof. Bruce A. Markell introduced Preference Law in the United States bankruptcy law, including its policy basis and six major elements. He also elaborated on the revocation of the four Preference Defenses. Afterwards, Prof. Bruce introduced the principle of “equitable parity” from the common law and the basic definition of the recharacterization system of equity and creditor rights from the perspective of bankruptcy law, the purpose of the legislation, and the various factors that influence the judge's accomplishment of this determination. After each lecture, Prof. Bruce had a deep communication with teachers and students. He has conducted detailed answers to questions raised by teachers and students, with many years of experience in legal practice and research work. Everyone has benefited from him. These lectures provides a good platform for our students to expand their horizons, and further strengthens the exchanges and cooperation between our school and Northwestern University Law School.